The snub-nosed revolver is alive and well. Many street-savvy police officers understand the importance of carrying a backup gun for those times when their primary weapon fails. Many fine compact pistols exist, but the snub revolver is less susceptible to fouling from dirt, dust, pocket lint or a naturally occurring substance than the finely tuned semiauto. frame proves reduction in felt recoil. Slight glitch midway through trigger stroke. Because the snubby is enjoying increased popularity, it isn’t surprising that Ruger has introduced a space-age, high-tech snubby hybrid: the LCR (Lightweight Compact Revolver). This 13.5 oz., small frame, five-shot, .38 Special revolver represents one of the most significant revolver design evolutions in a hundred years. The LCR’s .38 Special frame is an aerospace grade, 7000-series aluminum forging treated with a black synergistic hard coat that’s applied once it’s machined (the .357 Magnum and 9mm models are built on stainless steel frames). It was tested with more than 30 different chemicals and exceeded mil-spec salt spray tests while offering performance greater than hard-coat anodizing. This monolithic frame provides sturdy support for the cylinder and barrel. The 2″ barrel has a 1:16 twist and is made of 17-4 PH aerospace grade stainless steel. When this article first appeared, the LCR was available only in .38 Special +P. It’s now also available chambered in .357 Magnum, 9mm, .22 WMR and .22 LR. The LCR’s lightweight, polymer trigger housing contains the entire fire control assembly, which offers a higher level of functional reliability. The trigger assembly is put together with no hand-fitting, resulting in a highly consistent product at an affordable price. This also makes in-agency repair easier. The fiberglass-filled polymer frame provides a reduction in felt recoil. The frame’s grip peg allows for a variety of grips to be installed, and the LCR’s standard Hogue Tamer grip with a Sorbothane insert reduces perceived recoil even further. It’s small enough to hide in a coat pocket or an ankle holster but offers a full-hand grip for fast-action shooting. The result of a joint effort with Hogue, the LCR’s standard grip was designed using U.S. military ergonomic data on hand shape and size, so the LCR can be comfortably held by a wide range of hand sizes. An available Crimson Trace LaserGrip offers the advantages of a laser sighting system. The LCR from the right. Pulling together a number of street-proven loads, I headed to the range to test the snubby. I found the trigger action reasonably smooth with only a slight glitch midway through the trigger stroke. Although it would probably bother someone trying to get the tightest group possible, in rapid fire—the scenario in which the gun is likely to be used—it wouldn’t be noticed. 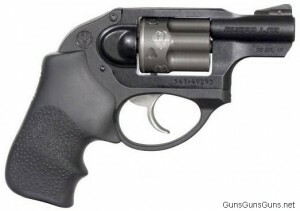 The Ruger LCR is one of the best .38 snubbies available—it’s as simple as that. .38 Special 5 1.875″ 6.5″ 4.5″ 1.28″ 13.5 oz. .357 Magnum 5 1.875″ 6.5″ 4.5″ 1.28″ 17.1 oz. 9mm 5 1.875″ 6.5″ 4.5″ 1.28″ 17.2 oz. .22 LR 8 1.875″ 6.5″ 4.5″ 1.28″ 14.9 oz. .22 WMR 6 1.875″ 6.5″ 4.5″ 1.28″ 16.6 oz. More versions: Ruger and Talo have developed two limited edition LCR that feature five engraved and satin filled Ruger logos and either a 24KT gold band on the cylinder, or a silver band. And Ruger now offers the LCRx, which features an exposed hammer. The Ruger/Talo model with the gold band. The Ruger/Talo model with the silver band. This entry was posted in .357 Magnum, .38 Special, .38 Special +P, $25-$250, $251-$500, 9mm, Compact, Revolver, Ruger, Subcompact, Talo and tagged Handgun Reviews on October 31, 2014 by Dave Spaulding. 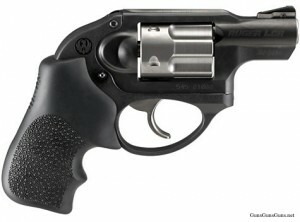 I have the Ruger LCR 38 SPL +P. It is an easy gun to carry and the weight does not tug even elastic waist shorts down. The Crimson Trace grip laser helps a lot though the sites I have are fairly good. The trigger pull is long and smooth and you will need to practice to be smooth, as with other double action revolvers. The .357 version is a quarter pound heavier, but the exact same size. This is not my primary concealed carry gun. I carry a Glock 27, but the Ruger LCR is much easier to conceal and when I dress light, I sometimes leave the Glock in the safe. 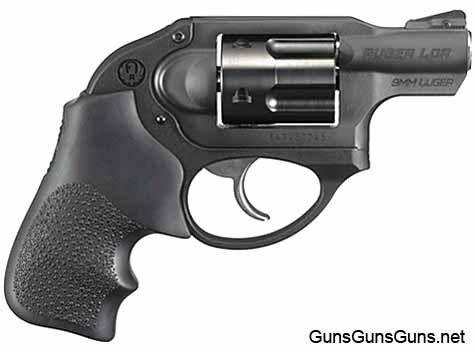 I have the Ruger LCR 38 SPL. A neat, light and well constructed handgun. For it’s purpose I like everything about it. I do not agree with those “experts” who say it has a “glitch” in the trigger pull. When target shooting I ease back the trigger until it touches this so called “glitch” let it rest there for my final aim to only pull back a slight distance which minimizes movement for the shot. This allows notable accuracy and a very close group for such a small handgun. My vote goes to Ruger for a well designed trigger mechanism. There is no such “glitch” in the Ruger LCR folks!!! Just purchased and shot the .357 model. It beats my S&W 438 J frame in the trigger pull, recoil, and comfort categories. Shooting .38 Special is a breeze. Shooting .357 is not pleasant, but is controllable for a diminutive, 17 oz. revolver. My only gripe is that a model is not available for sale already equipped with the XS tritium sight. I hate to say this of a Ruger; I have a number of them; all good until I ran into this LCR. The LCR is a DANGEROUS GUN to carry should you need to reload with an opponent challenging you for time. It may cost your life! Because the barrel release button (as Ruger calls it…crane latch release button) will at times, as often as 1 in 6 times, hang up totally, and not allow the barrel release to operate. You cannot push the button in, or it will be very hard to operate, requiring two hands, certainly not operating as smoothly as a Ruger SP101, or a Smith & Wesson. You must push straight in at the very end of the release button to have any reliability of operating, and even then, may be very hard to operate. Cycling the barrel release button at least 400 times has not made the latch button easier or more reliable to open. When I attempted to return the LCR, the dealer said that almost all of the 100 LCR’s in 357 mag, that he has sold, do this. However, my research shows this defect is across all calibers. My Ruger LCR 357 Mag seems to have been manufactered recently. I invite others to tell what their history has been with this revolver. One disappointed Ruger LCR owner. The LCR has the best DA trigger of any revolver I have ever used. This gun has been my CC ever since I bought it. The trigger is also the built in safety and is smooth working. I first used a Talon holster owb but anymore I just slip the gun into my front jeans pocket. Shooting 357 IMO is for SD use as it packs a pretty stout recoil. For practice I shoot the 38 special or +P. I have had no problems opening my cylinder. Shooting 357 I have had to let the cylinder cool down or ejecting the shells can be sticky situation. As usual Ruger has made a winner with this LCR. 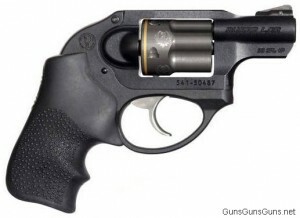 Just bought one of these in .357. Looked at the .38 as well but went for the .357 since I want the ability to shoot the magnums if I’m using this as a backup to a full size revolver. I also felt the steel frame would last longer than the aluminum one. Re George Howe above, I noticed that as well with the new .357 lcr the gun store. The used one I bought (Dec 2010) did not have the cylinder latch problem. The new .38 I looked at basically popped open when you touched the button. Would have gotten that one if they didn’t have he use 357. The salesman said all the new .357s were stiff. First ranger report: did have difficulty ejecting brass reliably after about 30 shots (didn’t try dumping them until then). They usually all come out of my SP101. Trigger is really good. Feels lighter than a 686 or a Model 19. Tested at 5 and 7 yards. Decent accuracy. I will want to paint the front post or change it out though. You can feel full house 357s but hit paper al five times at 5 yards. +Ps had more bark by not much more recoil, which isn’t bad with them. Owned the .357 for over a year now. Chose it for the steel frame & option of caliber. Over 1,000 rounds through it & never a failure, problem or issue. It does heat up with .357 & steady fire. 38+P is better for heat management. Highly recommend this little guy for about anything but squirrels. I am happy that the LCR .357 has worked out for you, Stan. I cannot give you a reason for my trouble. Maybe, my finger is bent or works differently. 🙂 Remember Joe PXXXX from the comic strip, Joe Palooka? He was always under a bad cloud, and always had trouble. Maybe, the artist followed me around to see what event I would model for the strip? I bought a 38-Spl LCR, and am very happy with it. No problems! Great gun. I’ve used it quite a bit and recommended to quite a few people. They all love it. I’ve probably shot less than 2000 rounds total in my life. My experience with the 38-Spl LCR is it hurts to shoot it. Not as much kick as my .357 magnum but it still took me by surprise after reading so many reviews about how this has less felt recoil etc. After 10 rounds or so I got used to it, but my hand was sore/bruised for a few days. I like the gun, will use it for concealed carry, and will shoot it more to toughen up my hand. But I’m not sure I’d recommend it for another amateur such as myself. Well made revolvers like this are much more reliable than a lot of my experiences with semi-auto firearms. They will always have a place in my arsenal. I think we bought a lemon, because we shot the gun for the first time, it would not fire on 2 out of 6 shots, the pin was hitting on edge of shell, no where near the middle. I know shells swell after fired, but they would not pop out of tumbler using the screw pen, we had to use a knife or poke from other end to get them out. This gun actually Super. I am using it and suggest to other to use it. I’ve been curious about the LCR for quite a while. When I recently saw a pre-owned LCR .38 at a price I couldn’t pass up I bought it. I didn’t quite know what to expect from this gun, and must say I’m very, very impressed even though I still need more practice with it to learn how to use the trigger better. In regard to the trigger “glitch”, I’ve been testing the trigger two ways. The first is using my finger’s tip to pull the trigger, In the second way the part of my finger that rests on the trigger is close to the fingers first joint. When using my finger tip the trigger feels smooth to me, all the way to the point of firing. In the second method, where I rest my finger closer to it’s first joint, I more clearly feel and notice that “sweet spot” where the trigger can rest for a final aim prior to firing the gun. I haven’t had any problems with the crane latch release button that George mentions. Recoil doesn’t feel too bad to me. At this point I’ve only run 50 shots down range. If I had to sell some of my arms it’d be others, and not the LCR. This LCR is a keeper, and I’d recommend it to anyone. Undoubtedly it’s one of the best gun which I’ve ever used. What is the Latest Cost of Ruger LCR?